Powered by Frooition.com Shop CategoriesHelpful LinksAdd to Favorite SellersSign up to NewsletterView FeedbackContact SellerVisit seller's eCRATER ShopAbout Seller Page LAUREATE BY TOWLE STERLING SILVER FLATWARE SET FOR 8 SERVICE 43 PIECES Item Description Beautiful LAUREATE BY TOWLE sterlingsilver Flatware set - 43 Pieces.Thisset includes: 8 KNIVES, 8 7/8" 8 FORKS, 7 3/8" 8 SALAD FORKS, 6 5/8" 8 TEASPOONS, 6 1/8"8 HOLLOW HANDLE BUTTER SPREADERS, 6 5/8"1 SERVING SPOON, 8 1/2"1 SUGAR SPOON, 5 7/8"1 HOLLOW HANDLE MASTER BUTTER KNIFE, 7" IncludesBONUS brand new storage chest. Excellent condition, not monogrammed. This set will be professionally polished and sealed in individual plasticsleeves prior to shipping. 100% SATISFACTION GUARANTEED! 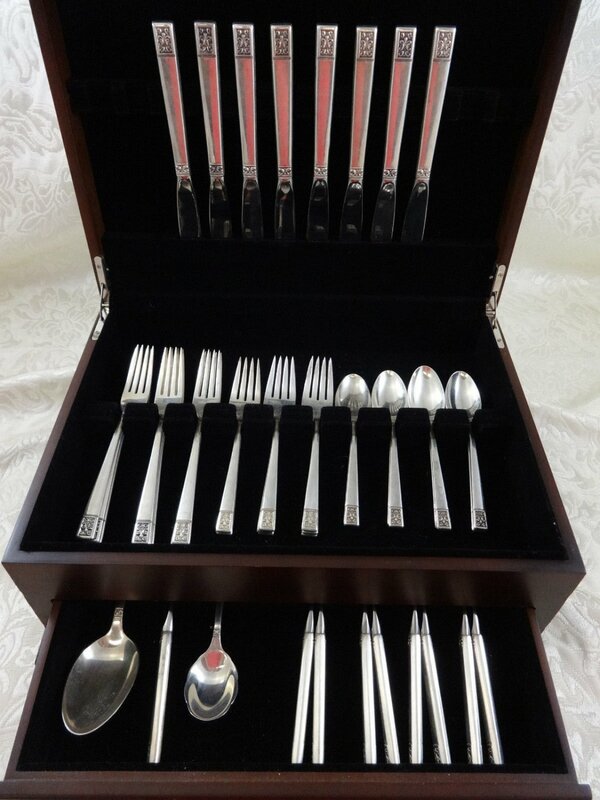 CLICK & shop our fabulous selection of FLATWARE SETS! TERMS & CONDITIONS We will happily combine shipping charges on multiple items purchased. Please wait to pay for multiple purchases until combined into one invoice. Payment is due within 3 days of purchase. If you are not satisfied with any item you receive, we will gladly refund your payment in full (less shipping charges) for items returned within 14 days of delivery. Return shipping paid by buyer. If in a rare instance a stock discrepancy prevents us from filling your order, we will issue a full refund. International Buyers Please Note: Import duties, taxes, and charges are not included in the item price or shipping cost. These charges are the buyer's responsibility. Please check with your country's customs office to determine what these additional costs will be prior to looking or buying. We strive for 100% customer satisfaction! Due to the weight & cost of shipping wood chests, new tarnish resistant flannel rolls will be substituted for all international shipments. Free bonus chests are not included in international shipments of sets and we will instead include bonus free flannel storage rolls. Wedgwood by International Sterling Silver Mayonnaise Ladle 5 1/2"
Gaycourt by Lunt Sterling Silver Salad Fork 6 1/4"
Duke of York by Whiting Sterling Silver Gravy Ladle Fluted Bowl 6 3/4"
Viking Rose by Marthinsen Sterling Silver Tea Strainer Fancy 5 1/2"
Yetive by Mount Vernon Sterling Silver Macaroni Server Gold Washed 9 1/8"
Florentine Lace by Reed & Barton Sterling Silver Pickle Fork 3-Tine 5 5/8"
Stratford by Whiting Sterling Silver Nut Spoon 4 1/2"